Investing in a mutual fund (MF) is not intuitive. Like other investment programmes, investing in an MF also requires research while returns are subject to market risks. But, MF’s give you a significant advantage of owning diversified holdings at reduced costs when compared to directly acquiring the same number of individual instruments from the market. These are some indisputable facts. However, there continues to be a lack of awareness about MF’s giving rise to several misconceptions. We shall address and bust some of the most common myths in this post. 1] Mutual funds are too risky. My money is safer in the bank. Mutual funds are affected by market volatilities. This fact may lead risk-averse investors to think that Fixed Deposits or FD’s providing guaranteed returns are better than MF’s. What is not taken into account, is that Mutual Funds have the potential to offer high inflation-adjusted or ‘real’ returns. With FD rates falling and inflation rising, in the current scenario, the real yields are low in case of an FD as compared to an MF. This is not to say, that you get tempted MF schemes that are designed to dupe you by promising by high and guaranteed returns. Careful selection of MF schemes is advisable. 2] Mutual Funds are only good for Tax benefits. A person with a medium risk profile may decide to invest in Mutual Funds only for the tax benefits. The Equity Linked Savings Scheme or ELSS is eligible for tax deduction under Section 80C of the Income Tax Act up to Rs. 1.5 lakhs, subject to a lock-in period of 3 years. The long-term capital gains (up to Rs. 1 lakh) and the dividends received from the instrument are also tax-free. But often, what goes unnoticed is that the category has also provided investors with excellent returns. A carefully selected MF scheme diversifies your risk and increases the chances of higher returns. But over-diversifying does not necessarily mean no risk. All MF’s are risky to a certain extent. People sometimes forget that risk appetite and risk tolerance are not similar. The former is personality driven and subjective while the latter can be easily calculated based on factors such as income, expenses and long-term and short-term financial goals of the investors. Once you know your risk tolerance, you can make informed decisions about your investment plan. 4] Mutual Funds only invest in stocks, and I don’t have a demat account to buy an MF. There are several well-performing Equity-linked MF’s. However, it is not true that all MF’s invest in the stock market. Depending on the risk profile and liquidity requirements of the investor, they could choose to put their money in Debt Funds, Liquid Funds, Balanced Funds, Fund of Funds etc. A Demat account is not required even in the case of an equity-linked MF. All you need to invest in an MF is submit a form along with the cheque to the nearest MF branch or distributor/broker. 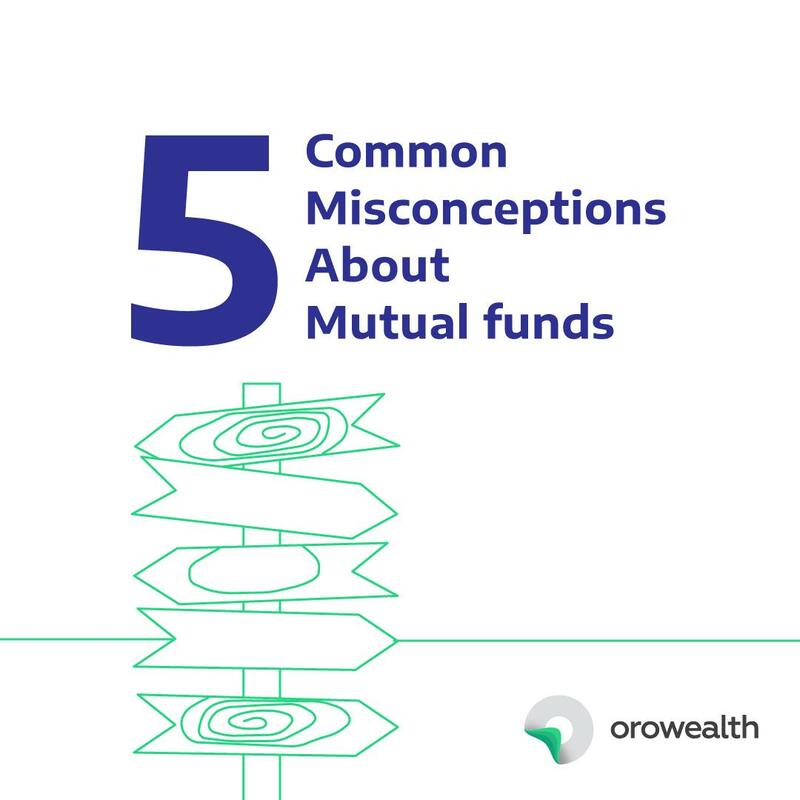 5] Mutual Funds are long-term funds. I don’t like blocking my money for long durations. There are funds tailored to meet the requirements of different investors. For someone who prefers liquidity, he could invest in Liquid Funds that in turn invest in money market and debt instruments (Commercial Paper, Treasury Bills etc.) of very short tenure. These funds can be redeemed within a couple of days. While these funds protect your capital, returns however, are not as high as that of other long-term funds. 6] You can’t make money in Mutual Funds unless you have a large corpus to invest. I don’t have that much money. There is no ideal amount to invest in mutual funds to be assured of high returns. As mentioned earlier, once your risk tolerance has been assessed, you could decide how much money you would like to invest in an MF. You could begin by keeping aside Rs. 500 every month towards an ELSS or a Systematic Investment Plan (SIP). 7] You should always invest in the fund with Lowest NAV and highest returns. Higher returns are a good indicator but not a guarantee for future performance. Similarly, it is a myth that an MF with a low NAV (Net Asset Value), i.e. low market value has a higher chance of appreciation as the one with a higher NAV, based solely on the price. If both fund plans are invested in the same portfolio of instruments, the returns of both will rise in the same proportion. MF returns are dependent on the scheme and not on the NAV. Campaigns such as the ‘Mutual Funds Sahi Hai’ and institutions such as Association of Mutual Funds in India (AMFI) have created a fair amount of awareness resulting in an increase in investments, especially from the Tier-2 and Tier-3 cities. But ill-informed myths are still big deterrents. For every investor who is willing to research and select the fund that suits his risk tolerance, MF’s are a great investment vehicle.